This article is brought to you by the Route 6 Alliance and based on my travels of Route 6. There’s nothing quite as American as a family road trip. However, there’s no need to head out west or to the beach for this summer’s road trip. 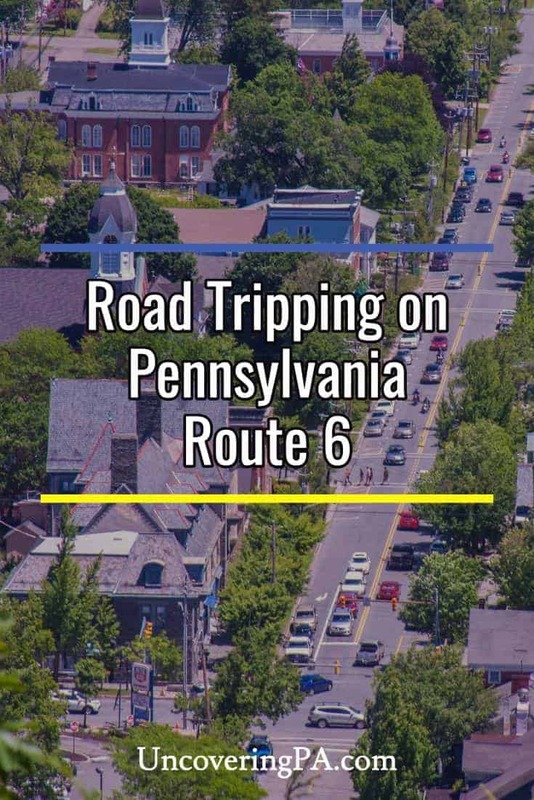 Instead, get the family in the car, even bring along the family dog if you want, and head out for a great American road trip along Pennsylvania’s Route 6. Recently, I had the opportunity to travel across Route 6 with my wife, two-year-old son, and dog, thanks to the Route 6 Alliance. We spent one week traveling this amazing route from the New York/Pennsylvania border in Matamoras to the Ohio/Pennsylvania border near Linesville. Along the way, we visited amazing natural sites, went to the beach, toured great museums, and ate delicious meals. Taking a family road trip along Route 6 with your pet can be a lot of fun. This edition of my guide to traveling Route 6 will cover the eastern third of the trip from the NY/PA border in Matamoras to Tunkhannock. This portion of the trip covers the first 100 miles or roughly a quarter of the trip across northern Pennsylvania. While Matamoras is a nice little town, the first major stop for most traveling along Route 6 is Milford. Milford is the county seat of Pike County, Pennsylvania, and features small artist studios, antique shops, and several great restaurants. It is also the gateway to the fabulous Delaware Water Gap National Recreation Area. The Delaware Water Gap National Recreation is a 70,000-acre park that straddles the Delaware River in both Pennsylvania and New Jersey. 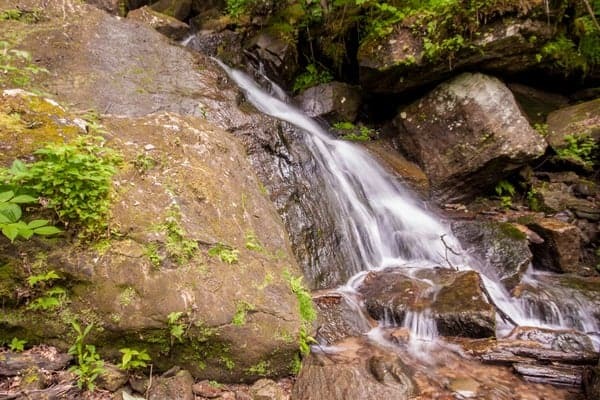 The northern portion of this beautiful area is located just south of Milford, offering road trippers easy access to the waterfalls, vistas, and hiking trails located here. Raymondskill Falls is the tallest waterfall in Pennsylvania and located just a few miles south of Route 6. While you could spend several days hiking in the Delaware Water Gap, if you have time for just one hike, visit the Cliff Park Trail System. 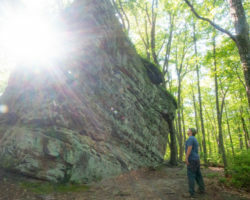 Those especially pressed for time can take the steep three-mile roundtrip hike up to Milford Knob along the Milford Knob Trail. 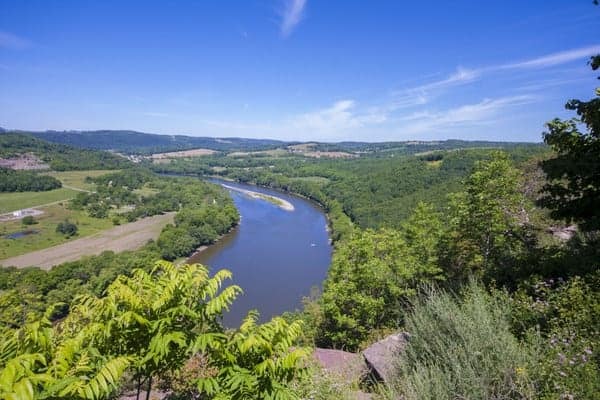 This vantage point offers amazing views over downtown Milford and the Delaware River Valley. The road directly in front of you and far below is Route 6, making this a perfect trail with which to start your trip. The view of Route 6 and downtown Milford from Milford Knob is very impressive. If you have more time, consider the 6-6.5 mile loop in the Cliff Park Trail System from the Cliff Park Trailhead. 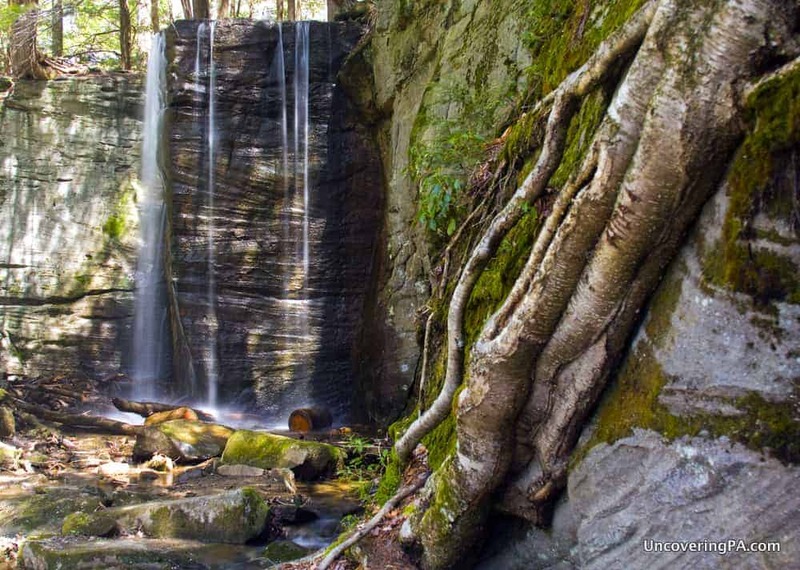 This will take you past the beautiful Hackers Falls, through beautiful forests, and past three additional overlooks before reaching Milford Knob. 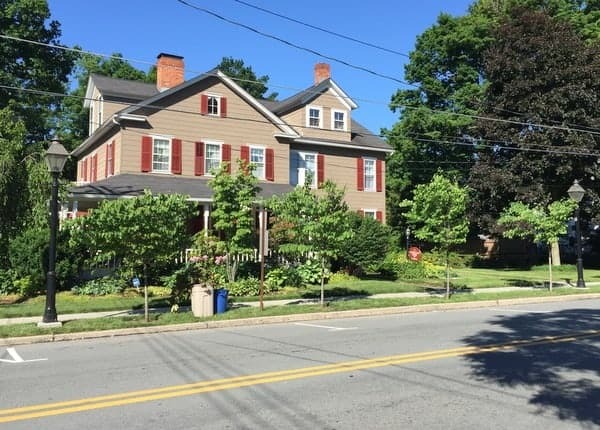 If you’ve made a day of visiting the Delaware Water Gap National Recreation Area, or just need somewhere to stay in the Milford area, the Harrington House is pet-friendly with pre-approval and offers a convenient place to stay in downtown Milford. 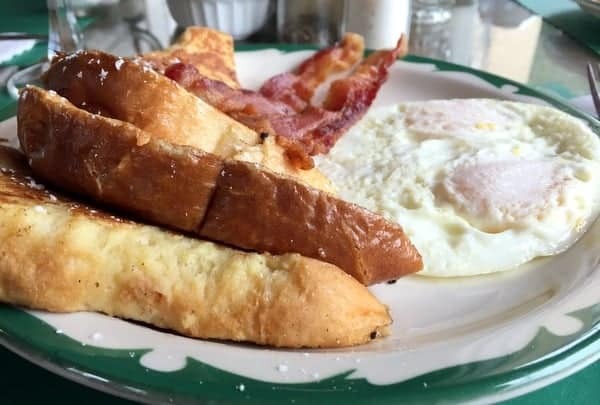 This 1860’s Victorian bed and breakfast is located directly along Route 6 and offers a delicious breakfast to get you started on your journey. You can read reviews of this place and others in the area on TripAdvisor (Affiliate Link). The Harrington House Bed and Breakfast is conveniently located along Route 6 in Milford. 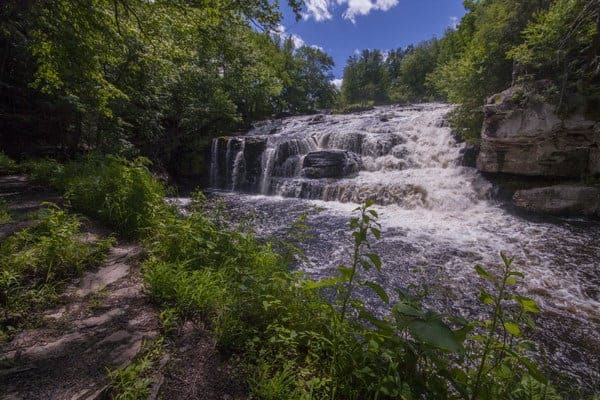 Continuing on from Milford, don’t miss the amazing Shohola Falls. Located 10 miles west of downtown Milford along Route 6, Shohola Falls is one of the most impressive waterfalls in Pennsylvania. At roughly 35-40 feet in height and at least that wide, this waterfall is well worth a quick stop along your Route 6 journey. Shohola Falls is one of the most impressive waterfalls that I’ve visited in Pennsylvania. From the main parking area, it’s possible to get to a side view of this waterfall in just a couple of minutes. There is also a frontal view along a narrow ledge, but this viewpoint can be very slippery and dangerous when wet or icy. A few more miles down Route 6 is Lake Wallenpaupack, one of the largest lakes in Pennsylvania. This area offers a variety of recreation options, and there are lake tours offered by boat. Hikers will enjoy Shuman Point Natural Area on the lake’s northwestern shores. This 250-acre natural area features fantastic views over the lake, forested hillsides, and the ruins of homes. A three-mile loop will take you through the area and offers a hike of great beauty that’s not very difficult. Hiking in Shuman Point Natural Area along the shores of Lake Wallenpaupack. On the eastern shores of the lake is Silver Birches Resort. This lake-front resort was recently remodeled and is one of the nicest places that I’ve stayed in Pennsylvania. I often get a bit nervous when a place calls itself “vintage.” However, Silver Birches has done it right, crafting a perfect combination of vintage and modern with quality touches. The resort offers a variety of places to stay and even has two dog-friendly rooms. You can read reviews of the resort on TripAdvisor (Affiliate Link). If you’re looking for somewhere to eat, The Dock is the restaurant at the Silver Birches. They offer a fantastic menu overlooking Lake Wallenpaupack. If you are looking for somewhere to relax and have a nice meal or a drink while watching the sunset, you can’t go wrong with a meal here. Overlooking Lake Wallenpaupack from Sunset Terrace at Silver Birches Resort. 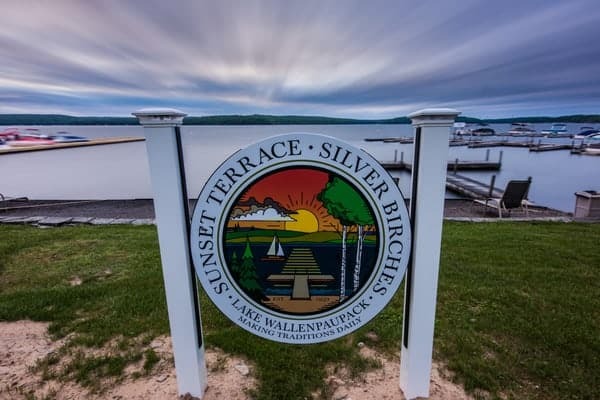 If you can manage to pull yourself away from the beauty and fun of Lake Wallenpaupack, there is a lot more to see and do along Route 6. History and outdoor lovers will want to make sure that they visit D&H Canal Park at Lock 31 just past Hawley. Here, visitors can see the remains of Lock 31 along the D&H Canal, which ran from the Hudson River in New York to Honesdale, Pennsylvania. Prior to the railroad, this canal was an important avenue for coal producers to get their products from northeastern Pennsylvania to markets around the world. The Lock 31 House sits alongside the remnants of the D & H Canal. At the park, visitors can see the well-preserved Lock 31 House, which served as an inn along the canal. 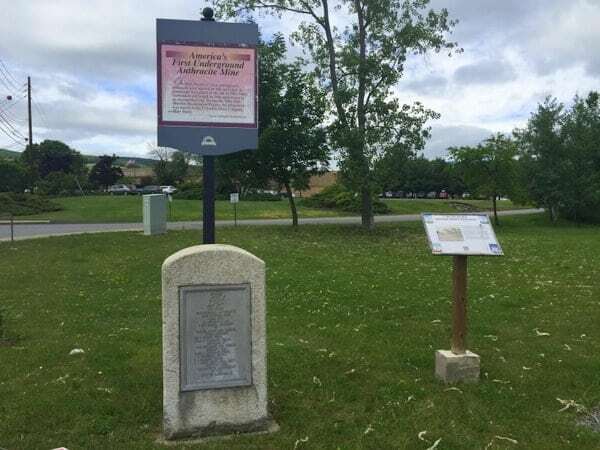 The park has a short trail with interpretive panels that follows the remains of the canal. 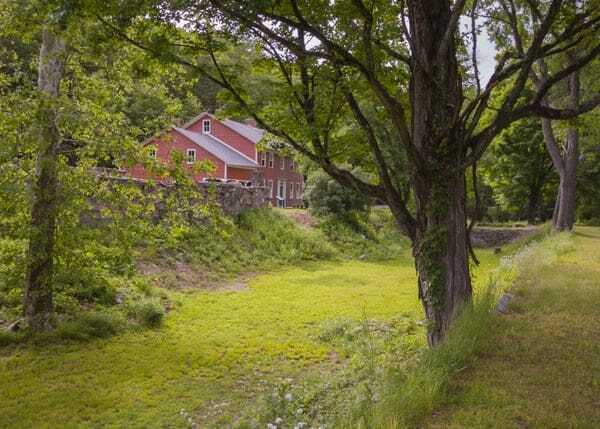 There is even access to a beautiful portion of the Lackawaxen River. The next stop on our family road trip along Route 6 is Prompton State Park. Located just a bit west of the very cute Honesdale, Prompton State Park is often overlooked by visitors to this region of the state. However, the park features some great hiking trails and, in the northern portion of the park, a few nice waterfalls. A waterfall in the northern reaches of Prompton State Park. 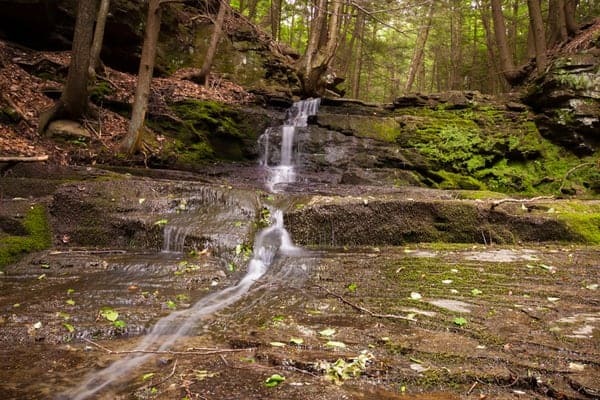 The waterfalls are along the Sidewinder Trail, which, when combined with the East Shore Trail and the Cliff Park Trail, provides an amazing hike through the forests of Wayne County, Pennsylvania. It’s worth noting that the waterfalls are only running at full capacity when water levels in the region are quite high, but it’s still a beautiful hike no matter what. Hiking in Prompton State Park. A few miles further west is the city of Carbondale. This community was home to the world’s first deep vein anthracite coal mine. The coal industry made Carbondale into a prosperous city, which is evident by the many beautiful buildings in the downtown area. Taking the Carbondale Smartphone Walking Tour gives visitors a chance to learn more about the history of this community. The downtown area is very walkable with plenty of space for adults, children, and dogs to enjoy the area. The Carbondale Smartphone Walking Tour includes stops like the world’s first deep vein anthracite coal mine. The walking tour covers more than half a dozen stops in downtown Carbondale. Some tell the history of the area’s community and industry, while one covers a UFO sighting in the town. All of them offer a unique look into the history of the community and provide visitors with a great chance to walk around this beautiful downtown area. When leaving Carbondale, follow Business Route 6 southwest to Archbald Pothole State Park. 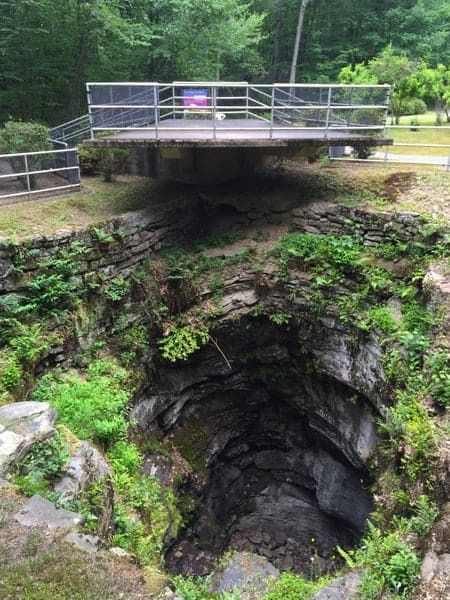 This small park is home to a very large glacial pothole. While some say it just looks like a giant hole in the ground, its impressive size and unique geological history make it a nice, but very brief stop. Archbald Pothole State Park is a worthwhile stop right along Route 6, south of Carbondale. Continuing on, you have a choice. Route 6 continues south past Blakely Falls and into Scranton before heading back northwest. 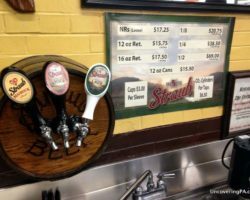 In my previous visits to Scranton, I enjoyed stoping at Steamtown National Historic Site, the Everhart Museum, Nay Aug Falls, and other places in and around the city. However, in the interest of time, many traveling across Route 6 take a shortcut north of Scranton, traveling between Carbondale and Clarks Summit. No matter which route you choose, stopping at the Northern Electric Trolley Trail in Clarks Summit is a great place to stretch your legs. This trail follows the former path of the Northern Electric Trolley, which ran between Scranton and Montrose, Pennsylvania, from 1907-1932. 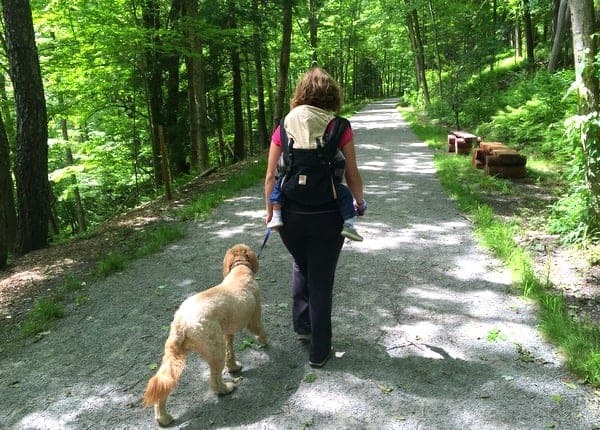 While the trail might not be the most scenic or challenging hike in this portion of Pennsylvania, this trail is great for those looking for a nice walk through the woods with the family, somewhere easy to ride a bike, or a bit of exercise while doing a road trip. The Northern Electric Trolley Trail is a rail trail in Clarks Summit, PA. 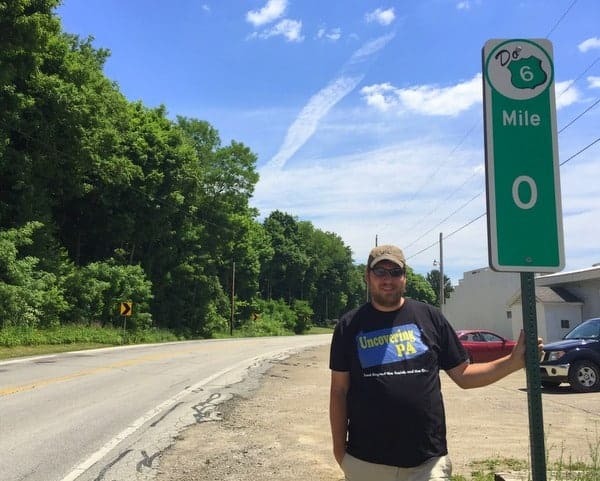 Picking up Route 6 again in Clarks Summit, the road passes through Factoryville, birthplace of baseball legend Christy Mathewson, before finally pulling into Tunkhannock. Along the way, a detour to the amazing Tunkhannock Viaduct in Nicholson is well worth the time. At one point, this was the world’s largest concrete structure, and it still carries trains over the valley today. 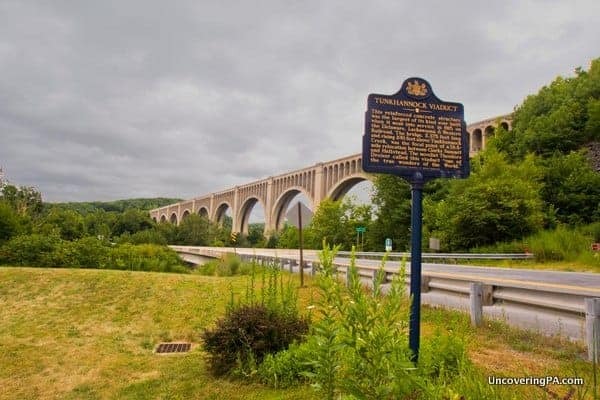 The Tunkhannock Viaduct is a worthwhile detour from Route 6. The last stop on this portion of the trip is Tunkhannock, the county seat of Wyoming County, Pennsylvania. This is a perfect spot to stay the night and offers a nice downtown with some delicious restaurants. 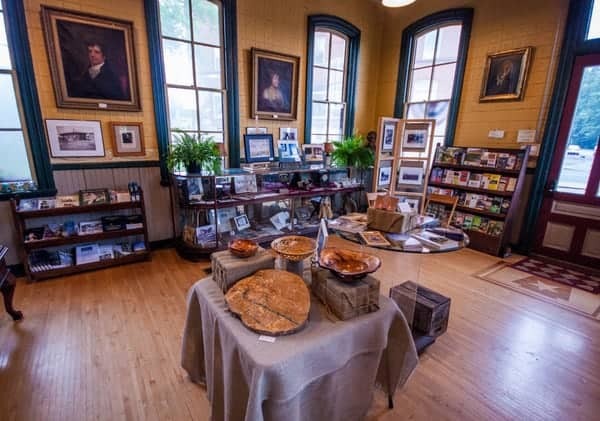 If you arrive early enough in the day, take the time to visit the Wyoming County Historical Society Museum or try some wine and beer at Nimble Hill Winery and Brewery, whose shop is on the outskirts of town. You can also head to the roadside Osterhout Falls, which is just a few minutes outside of town. A great place to spend the night is the Comfort Inn and Suites on the opposite side of the Susquehanna River from downtown Tunkhannock. This hotel won the company’s Platinum Award for excellence and offers nice views of the Susquehanna River from some rooms. They also take dogs, which is a bonus for those wanting to travel with your pet. You can read reviews of this hotel in others in Tunkhannock on TripAdvisor. The Comfort Inn and Suites in Tunkhannock is a Platinum Award winner. A great dining option is Twigs Restaurant and Cafe. This restaurant offers delicious food in a well put together, but casual setting. A dinner in their front window, with a view of downtown Tunkhannock in front of you, is a perfect way to end a day traveling Route 6. Once you reach Tunkhannock, you are approximately 100 miles from the start of Pennsylvania Route 6, and have roughly 300 miles still to travel to the Ohio border. 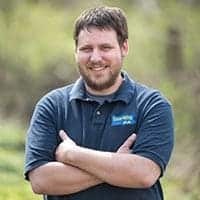 In this guide, I’ll cover all of the great things to do between Tunkhannock and Kane, a distance of approximately 185 miles along Route 6. While you certainly could spend much more time, this section can be completed in two to three days. After spending the night in Tunkhannock, head west out of town on Route 6. 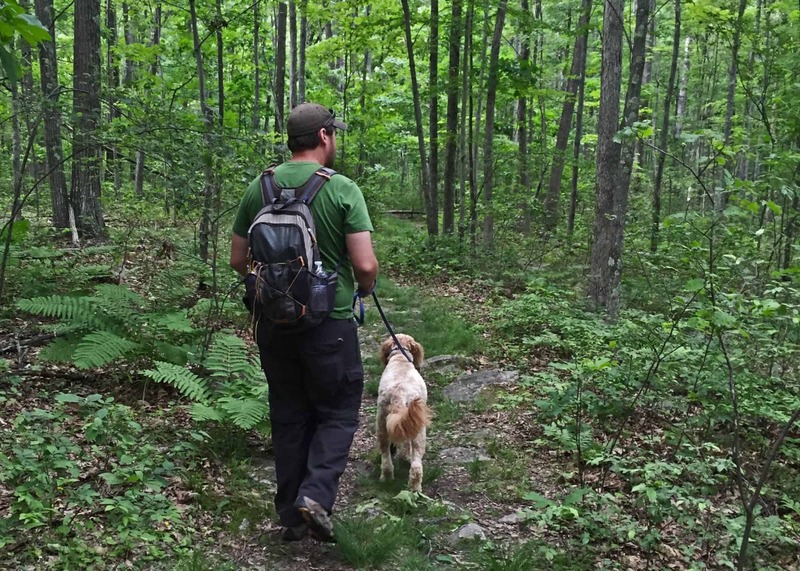 After just a few miles, you’ll come to the Endless Mountains Nature Preserve. The Endless Mountains Nature Center is a non-profit organization that runs a nature center, trails, and day camps along the banks of the Susquehanna River. Located behind Camp Lackawanna, the grounds feature 11 miles of trails and a nature center. 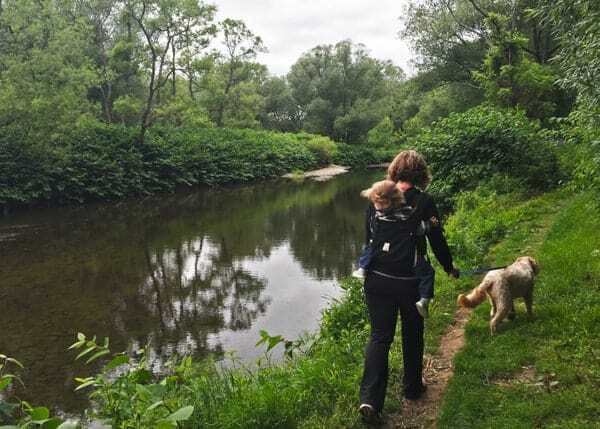 Visitors can hike the trails, which pass along a historic canal and along the river. Look closely and you might even see the center’s bald eagle nest. 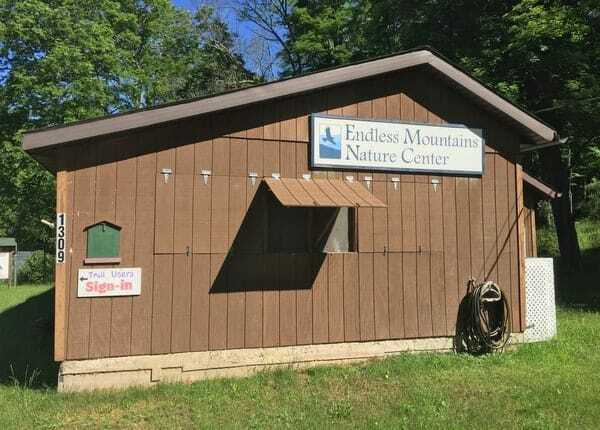 The Endless Mountains Nature Center near Tunkhannock, PA.
Back on Route 6, head for an entirely different type of adventure and do some wine and beer tasting at Grovedale Winery and Red Barge Brewing, which are located under the same roof in Wyalusing. Wine tastings and beer tasting here offer a chance to try some of their delicious offerings, and their beautiful patio is a great place to relax for a bit while having a glass of wine or beer. Grovedale Winery and Red Barge Brewing both offer delicious drinks along Route 6. Between Wyalusing and Towanda, Route 6 follows along a ridgeline along the Susquehanna River. Make sure to look out for the two overlooks along this stretch of the roadway. 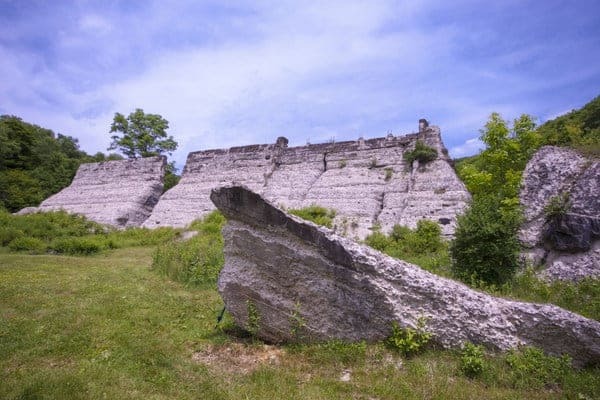 The first is known as Wyalusing Rocks. Follow the obvious trail to the left of the parking area to get to the rocky outcropping. While you can get a nice view from the parking area, these rocks are only a few hundred feet away and offer an even more amazing view. The impressive view from Wyalusing Rocks along Route 6. Just over three miles further down the road is Marie Antoinette Overlook. This spot overlooks a beautiful curve in the Susquehanna River and features some interesting architecture in the overlook itself. The spot is known as Marie Antoinette Overlook because of French Azilum, which was to have inhabited nearly all of the land on the far side of the river. This was a short-lived community for French aristocrats fleeing the French Revolution. It is said, that if Queen Marie Antoinette had been able to flee France, that she would have come to this spot. If you have the chance, take the short diversion off of Route 6 to visit French Azilum Historic Site. One of the recreated cabins at French Azilum. The next community that you’ll come to while driving west across Route 6 is Towanda, the seat of Bradford County, Pennsylvania. If you’re arriving around lunchtime, stop at the Red Rose Diner in downtown. This quaint little dinner is one of the neatest little places to eat that you’ll find along Route 6 and offers a nice meal at an inexpensive price. For those traveling with pets, the diner also offers a few outdoor seats in nice weather. 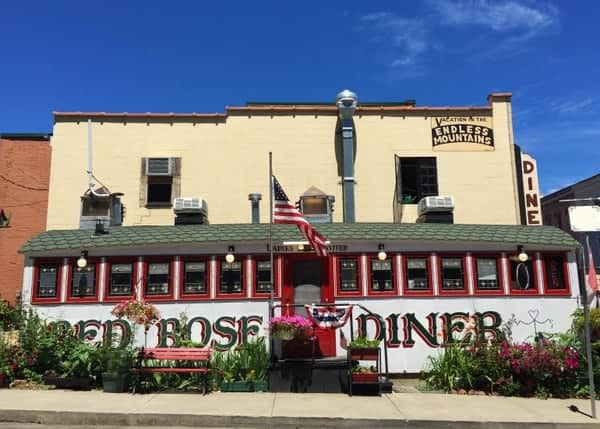 The quaint Red Rose Diner makes for a great stop along Route 6 in Towanda. If you have time while you’re in Towanda, take a walk along the riverfront or head over to the Bradford County Historical Society Museum, which is located inside the town’s old jail. In addition to having some great exhibits about life in the area, the intact jail provides many interesting stories on its own. Just past Towanda is Knapp Covered Bridge, the only historic covered bridge located along PA Route 6. 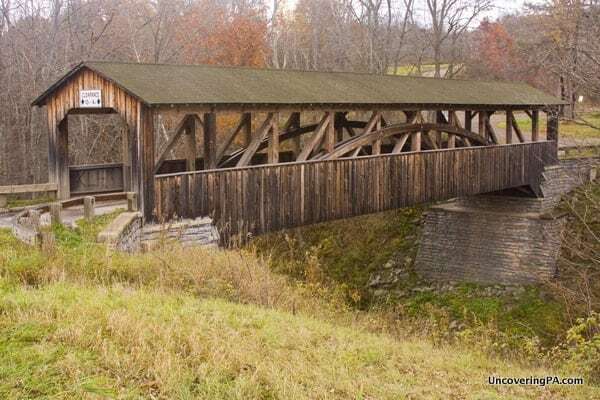 This beautiful bridge crosses a wide chasm over Browns Creek and was built in 1853. Reconstructed in 2000, this bridge is very beautiful and is well worth the short detour to see. Knapp Covered Bridge is the only historic covered bridge along Pennsylvania Route 6. A bit further west on Route 6 is Mount Pisgah State Park. The dominant feature of the park is Stephen Foster Lake, which is a great fishing spot for those looking to take a break from their road trip across Route 6. The lake is named for 19th-century composer, Stephen Foster, who spent time in the area. Hikers will enjoy the three-mile hike around the lake on the Oh! Susanna Trail. This trail is fairly easy, but provides beautiful views of the lake. While it’s not well-marked in places, it would be hard to get lost since you are simply hiking a loop along the lake’s perimeter. The park is also home to a great playground and swimming pool. 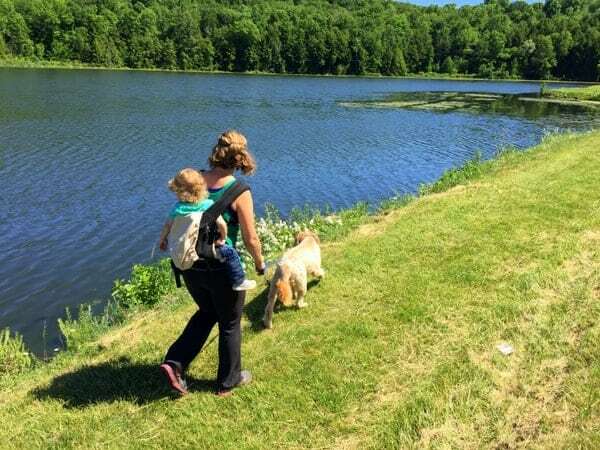 A family hike along the shores of Stephen Foster Lake in Mount Pisgah State Park. On the way to Mansfield, Route 6 passes through several small towns. If you have time, art enthusiasts will enjoy the Settlement House in Sylvania, which features the work of more than 50 local artists. Mansfield is a great place to spend the night while traveling PA Route 6. The Comfort Inn in Mansfield is a clean stop and takes pets. You can read reviews of hotels in Mansfield on TripAdvisor. If you’re looking for something to do in Mansfield, the History Center on Main offers a great look at the community’s history. Just across the parking lot from the hotel is Lambs Creek, a great local restaurant. 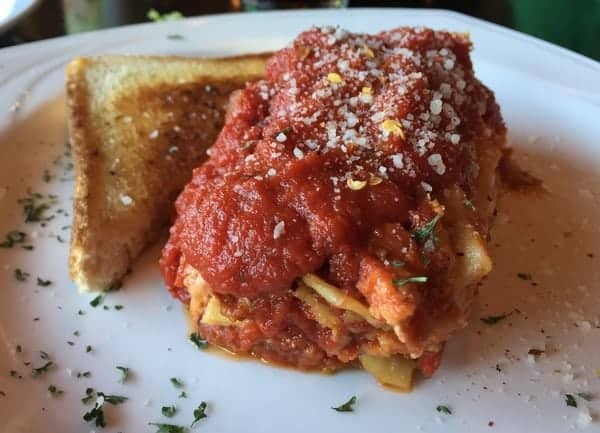 The menu specializes in Italian food, but offers a great variety for those looking for something different. Make sure you save some room here for dessert, as it’s quite delicious. Delicious lasagna at Lambs Creek in Mansfield. After spending a night in Mansfield, continue your way west along Route 6 to Hills Creek State Park. Like Mount Pisgah, this park is also dominated by a man-made lake. A three-mile trail will take you around the perimeter of Hill Creek Lake. If you don’t have enough time to do the entire hike, the section between Beaver Hut Boat Launch and Pines Boat Launch is very scenic and is about 1.5 miles in length. On the opposite side of the lake, a small beach gives visitors a chance to cool off in this peaceful lake. The next large community on PA Route 6 is Wellsboro. Wellsboro is one of my favorite small towns in Pennsylvania, and the downtown area definitely warrants some time. Just prior to the downtown area, don’t miss Highland Chocolates. Not only do they make delicious candies, but they also give jobs to mentally-disabled people. Just north of downtown Wellsboro is the station for the Tioga Central Railroad. 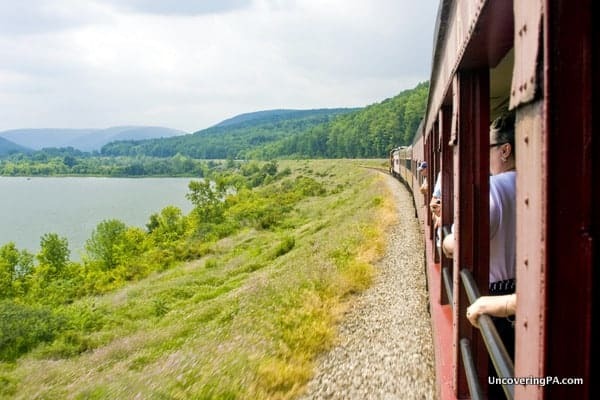 This excursion train takes visitors into northern Tioga County and up to the shores of Hammond Lake. Along the way, riders can get a meal or just watch the scenery go by. This is definitely a great trip for train lovers, though it’s worth noting that if you are traveling with a dog, they are not permitted on the train. The Tioga Central Railroad rides along the tracks towards Wellsboro, PA.
Across the street from the Tioga Central Railroad is the start of the Pine Creek Rail Trail. 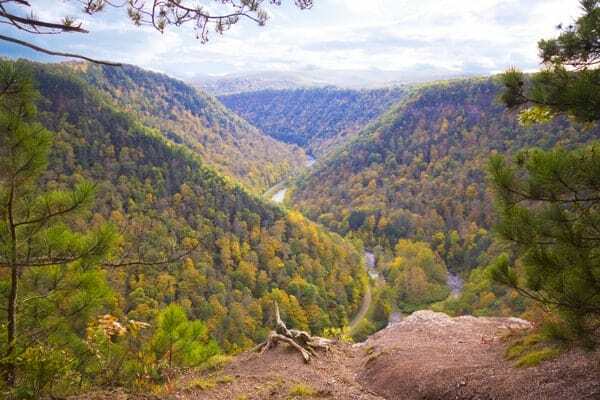 This 65-mile trail is perfect for biking and walking and takes visitors from this area north of Wellsboro, through the Pennsylvania Grand Canyon, and down to Jersey Shore, PA. If you plan to walk or bike the Pine Creek Rail Trail, however, a better access point is at the Darling Run Access Area. This is considered the start of the PA Grand Canyon and allows hikers to immediately immerse themselves in the canyon. From here, visitors can walk a short distance into the canyon, or even travel a few miles to the base of the Turkey Path in Leonard Harrison State Park. Walking along the Pine Creek Rail Trail near the Darling Run Access Area. Leonard Harrison State Park is probably the most popular area from which to overlook the canyon. From the top of the canyon, visitors can see hundreds of feet to Pine Creek below and watch as the canyon twists and turns with the creek. A short hike brings visitors to Otter View, one of the best viewpoints for the canyon. A portion of the viewing area at Leonard Harrison State Park. A much more challenging hike is the Turkey Path in Leonard Harrison State Park. 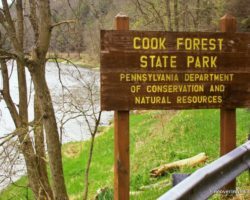 This two-mile trail descends steeply into the PA Grand Canyon and passes several beautiful, but unnamed waterfalls along its route to the bottom and the Pine Creek Rail Trail. Walkers and Bikers along the Pine Creek Rail Trail can also climb up the path to see the waterfalls and overlooks. One of the waterfalls along the Turkey Path and Little Four Mile Run in the Pennsylvania Grand Canyon. While this trail is nice, if you’ve already done the Turkey Path in Leonard Harrison State Park and are running short on time, check out the Barbour Rock Trail. 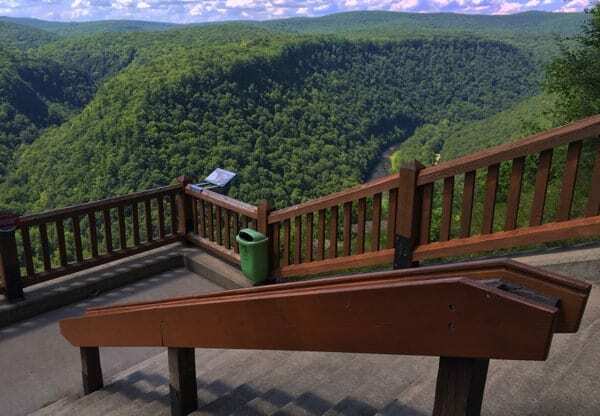 This 1.5 mile, handicap-accessible trail, takes you to what might be the best overlook in all of the Pennsylvania Grand Canyon. The view from Barbour Rock shouldn’t be missed when visiting the Pennsylvania Grand Canyon. If you’ve spent the entire day exploring the area around the Pennsylvania Grand Canyon, head back into Wellsboro and spend the night at the Penn Wells Hotel and Lodge. This hotel offers a wide variety of rooms, some of which accept pets (Reservations with pets can only be made by calling the hotel.) You can read reviews of Wellsboro hotels on TripAdvisor. Whether you spent the night in Wellsboro or not, the Pennsylvania Lumber Museum is a great place for visitors to stop along Route 6. 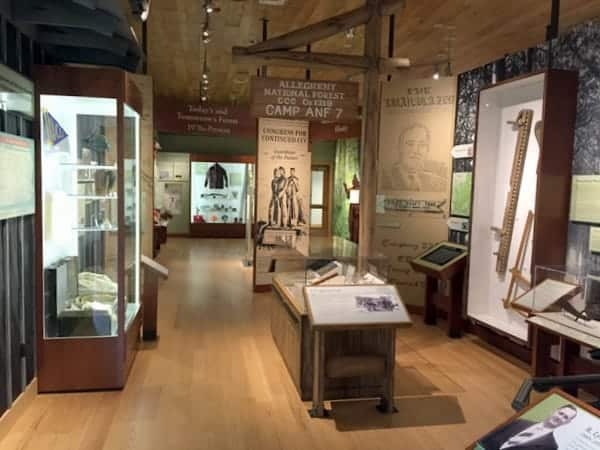 This museum reopened in early 2015 after undergoing a major renovation and does an excellent job telling the story of Pennsylvania’s lumber industry. The Pennsylvania Lumber Museum in Potter County does a great job of telling the story of this important industry in PA.
One of the oddest places along Route 6 is the Coudersport Ice Mine, a few miles east of downtown Coudersport in Potter County. This ice mine features a hole in the ground where ice naturally forms during the warmest months of the year, and disappears when the weather outside is cold. This is a fascinating natural oddity that’s worth a brief stop on your Route 6 road trip. A bit south of Route 6 are the ruins of Austin Dam. Located in a beautiful local park, Austin Dam was in operation from 1909 until September 30, 1911 when it failed. This was the second-worst dam failure in Pennsylvania history and resulted in 78 deaths. The ruins of Austin Dam are worth the detour off of Route 6 to see. Today, a visit to the ruins of Austin Dam gives visitors a chance to learn about this history and see one of PA’s most impressive sites. The picnic tables here make for a great picnic spot. Back on Route 6, you’ll find yourself in Coudersport, the seat of Potter County. This small community has a charming downtown area. It’s worth taking a few minutes to walk around the area to see the small shops and restaurants. You can also see the Allegheny River just a few miles from its source. It’s hard to believe that this small waterway eventually becomes one of the might rivers in Pittsburgh. Downtown Coudersport is full of small shops and restaurants and is worth a stop while driving across Route 6. Traveling along Route 6 into McKean County, Pennsylvania, make sure to stop in the beautiful community of Smethport. 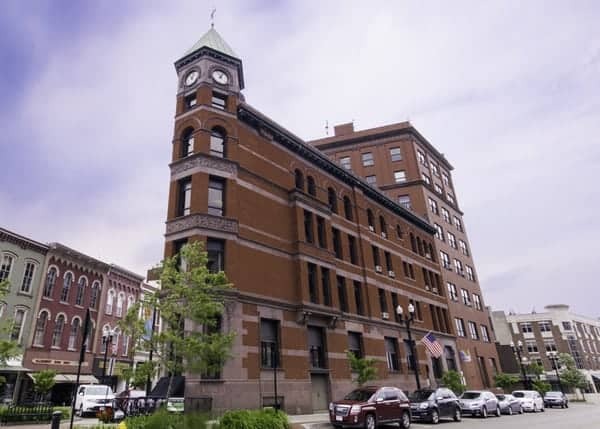 This borough was once home to many wealthy lumber and banking magnates, and the downtown area is full of many beautiful homes in an area known as the Mansion District. The Smethport Mansion District Walking Tour guides visitors through the downtown area and past many of the town’s most impressive homes. The brochure offers a bit of history about the home and its residents, along with offering tidbits that would interest fans of architecture. One of the highlights of the tour is the Old Jail Museum, which also serves as the county’s historical society museum. West of Smethport is Kinzua Bridge State Park, one of Pennsylvania’s most impressive state parks. 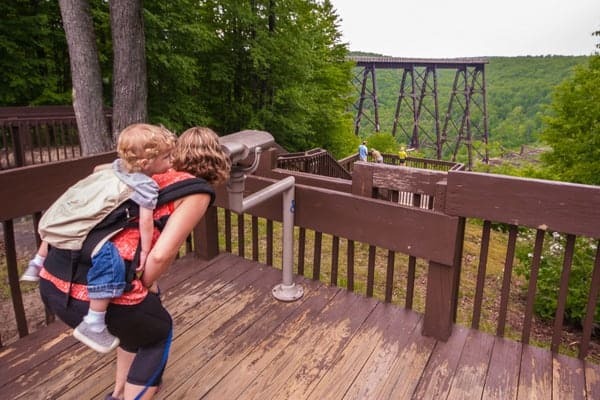 This park centers around the remains of the Kinzua Viaduct, which was the tallest and longest railroad bridge in the world when it was completed in 1882. While undergoing restoration in 2003, the bridge was hit by a tornado, which destroyed 60% of the bridge. Kinzua Bridge State Park is a must-visit attraction along Route 6. Instead of rebuilding the bridge, the ruins were left where they lay on the valley below, and the rest of the bridge was turned into a fantastic skywalk, complete with a glass floor. This skywalk provides an amazing view over the valley below. Visitors can also walk to the base of the bridge and view the ruins for themselves. From Kinzua Bridge State Park, it’s a short distance over to Kane. Kane Manor is a bed and breakfast that offers a nice place to stay. This home was built for General Thomas L. Kane, the man responsible for the Kinzua Bridge. You can read reviews of Kane Manor on TripAdvisor. The main manor is very opulent but does not accept pets. However, pets are allowed in the Longhorn House across the street, which is part of the mansion’s property. 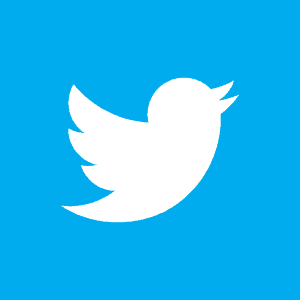 While clean, it would be nice for wifi to be included at the home. Breakfast is provided each morning at Kane Manor, which gives visitors staying in Longhorn House a chance to see the inside of this beautiful home. A hearty and delicious breakfast at Kane Manor in Kane, PA. 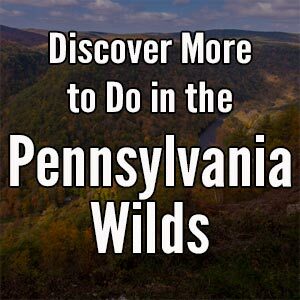 This guide to the western third of PA Route 6 will cover the 122 miles from Kane, in McKean County, to the Pennsylvania/Ohio border in Crawford County. 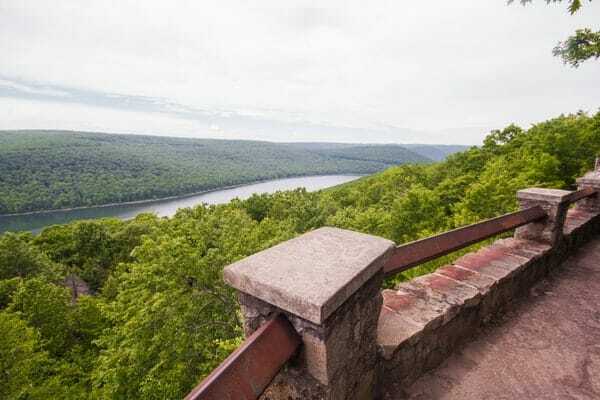 While it would be possible to see much of the things in this guide in two days, taking three days will allow you to take your time and enjoy the many charms of northwestern Pennsylvania. Before leaving Kane, make time to visit Artworks at the Depot. Part art gallery and part historical society museum, Artworks at the Depot features the work of local artists in a variety of mediums. You might not think that a small community such as Kane would have so many great artists, but I was very impressed by the quality of the artwork at this co-op. Artworks at the Depot is an art co-op and historical museum housed in a 19th-century train depot in Kane. Scattered throughout the gallery are items related to the history of Kane. I especially enjoyed the photos of the Kane family (for whom Kane Manor was built) and the Civil War items that belong the General Thomas Kane. The museum also features a nice collection of vintage Holgate Toys, which were once manufactured in the town. From Kane to Warren, Route 6 passes through the Allegheny National Forest. This forest covers more than 500,000 acres of northwestern Pennsylvania and is one of the areas of protected land in Pennsylvania. 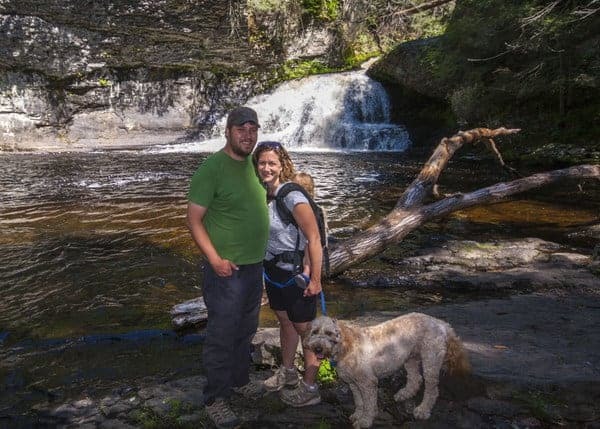 Those looking for hiking can hike for miles on the North Country Trail, which crosses through the forest on its route from New York to North Dakota. 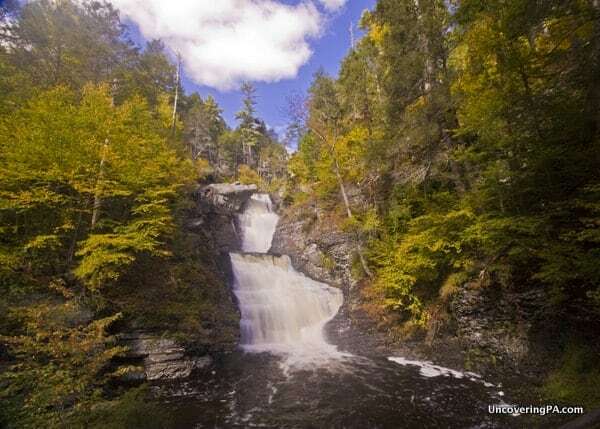 Another great option is the hike to Hector Falls near Ludlow. 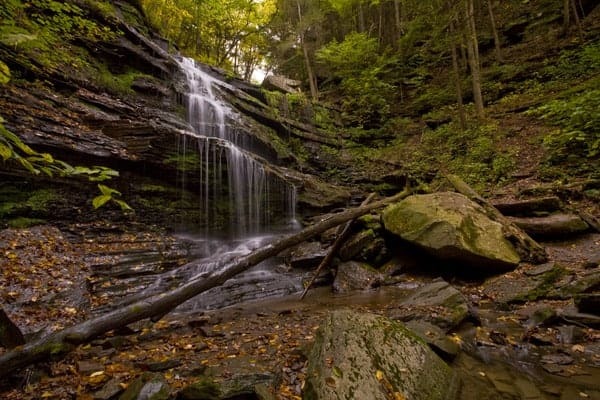 This is one of the most unique waterfalls in Pennsylvania, and the hike to get there is primarily on old forest roads. It’s worth noting, however, that the road to get there is quite rough and attempting to get to this waterfall in a standard car is probably not wise. Hector Falls is hidden away in the Allegheny National Forest along Route 6. Just a few miles further down Route 6 in the town of Sheffield is Allegheny Cellars Winery. If you enjoy sweet wines, this is a great stop. Try their Bigfoot Shadows wine, which tastes like adult grape juice and is one of my personal favorite Pennsylvania wines. The city of Warren is one of the largest communities along Route 6 west of Scranton. This bustling city of over 10,000 residents is home to several large buildings and a vibrant downtown area. Take some time to walk the streets of the city and check out the city’s shops and restaurants. The beautiful downtown of Warren, Pennsylvania. Make sure to locate the replica of the St. Louis Arch located outside of the Warren County Chamber of Business and Industry building. Warren is where 80% of the Arch was constructed, and a small replica has been created to honor the workers who made it. 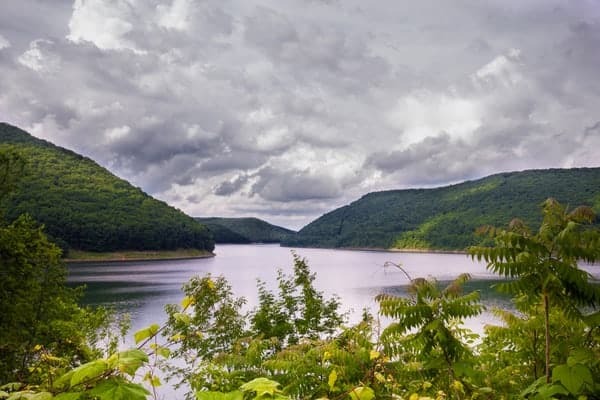 While Warren is a great city to visit, the area is primarily known for the Allegheny Reservoir, also known as Kinzua Lake. The Allegheny Reservoir was created in 1965 when the Kinzua Dam was constructed on the Allegheny River. 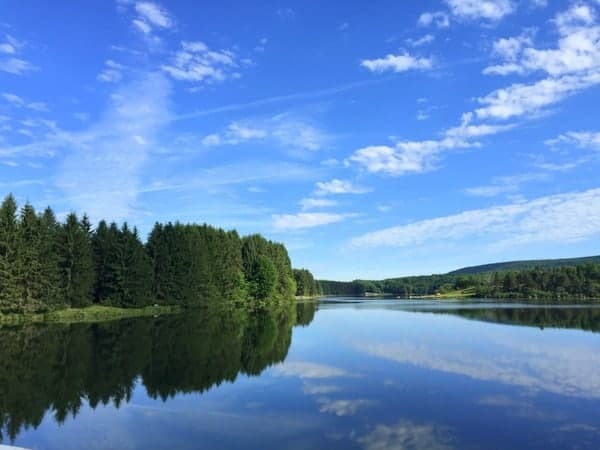 This 21,000-acre lake is almost completely surrounded by the Allegheny National Forest and stretches into New York. Looking out over the Allegheny Reservoir on a stormy day. This lake is popular with boaters and fishermen, but those traveling Route 6 can still enjoy this beautiful lake from shore. 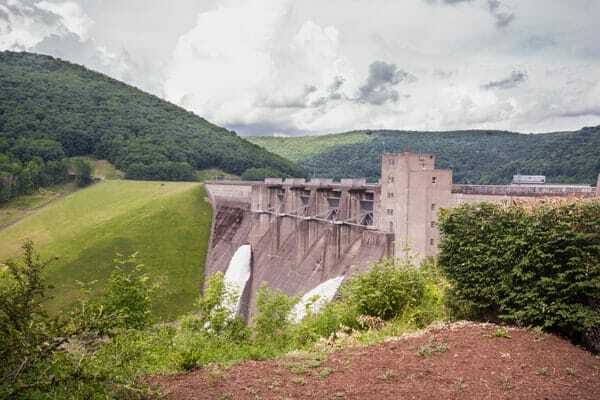 Taking Route 59 east of Warren takes you along the southern shores of Kinzua Lake and past Kinzua Dam. There are viewing areas both below the dam and above it, with both a hiking trail and the road connecting the two. While you can’t see the dam from the lower area near the Kinzua Dam Visitor Center, this is still a nice place to stop to see the incredibly clear green waters of the river. It is also a popular boat launch for both powered boats and kayaking trips down the Allegheny River towards Warren. Overlooking Kinzua Dam on the Allegheny Reservoir. The viewing area above the dam lets you get an excellent look at Kinzua Dam, one of the largest dams east of the Mississippi. Watching water get released from the dam is an impressive sight if you, like me, haven’t seen it on this scale before. Just north of the dam is Bent Run Falls. This waterfall, which is not visible from the road, flows downhill along the Bent Run Falls Trail. There is a trail that follows the creek uphill for nearly three miles. However, for those that have just a short amount of time, the lowest portion of the run, including a part directly downhill from the parking area, offers several small, but nice waterfalls. The lowest portion of Bent Run Falls near Kinzua Dam. A bit further up the road is Rimrock Overlook. This viewing area offers an impressive view over the Allegheny Reservoir. A short, but somewhat steep trail from the parking lot takes you to several viewing platforms. A set of very narrow stairs have been cut through the rocks and allow access to the area below the overlook. The area below the rocks is very neat to explore and there are several small caves that provide a very refreshing natural air conditioning. The view from Rimrock Overlook is very beautiful. If you are interested in a hike, it is possible to take the short, but challenging hike down the hillside to the Kinzua Beach Picnic Area. Should you not want to hike down, you can also drive to this recreation area. 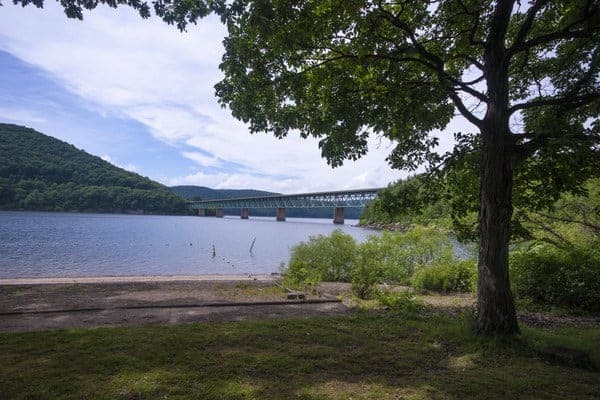 The Kinzua Beach Picnic Area offers a small beach and swimming area, along with shaded picnic tables. This is a great place to visit for those that want to take a refreshing swim in the lake. If you are traveling with a pet, it should be noted that dogs are allowed in the picnic area but are not allowed on the beach. Overlooking Kinzua Beach and the Allegheny Reservoir. 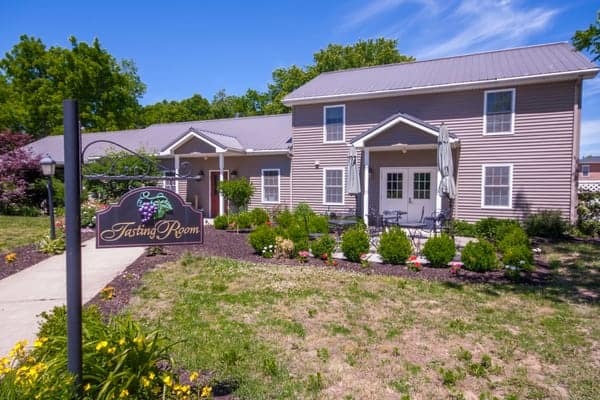 If you are looking for a unique place to stay in the area, consider Deep Woods Vacation Rentals. 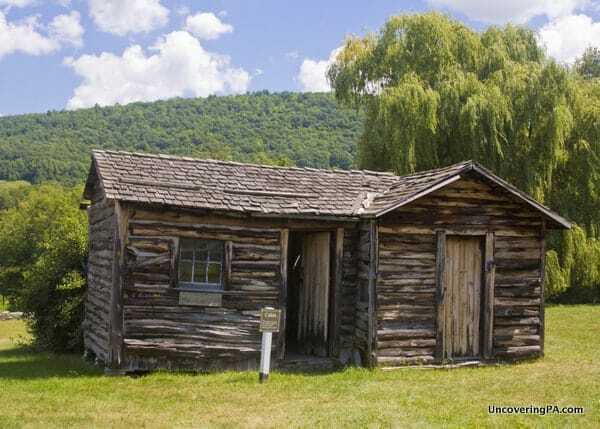 Located about 20 minutes north of Warren, these cabins live up to their name by being located in a very remote part of Warren County near the New York border. While they could use a bit of redecoration, they are beautiful cabins and provide a clean and relaxing place to stay. They even accept pets in the cabins. Given the remoteness of the cabins, it’s a good idea to pick up dinner prior to leaving Warren. On a whim, I opted to eat at Wells Hog Wild BBQ, which was some of the best barbecue I’ve had in Pennsylvania. Moving west on Route 6 from the Warren area, your next stop is Corry, a small city in Erie County. 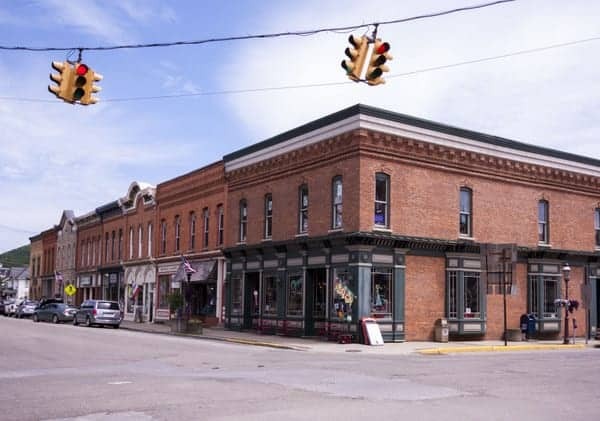 Corry is home to a beautiful downtown area that’s well-worth exploring. Corry’s Trail of Simple Pleasures is a three-mile walking tour that takes you past some of the city’s most interesting sites and offers information about six of them. Corry, Pennsylvania, is home to a beautiful downtown area that’s a great stop on Route 6. If you find yourself in town on a Thursday or Sunday afternoon, the walking tour takes you right past the Corry Area Historical Society Museum. While it was unfortunately closed during my visit, a quick look through the windows told me that I need to go back and visit it someday soon. 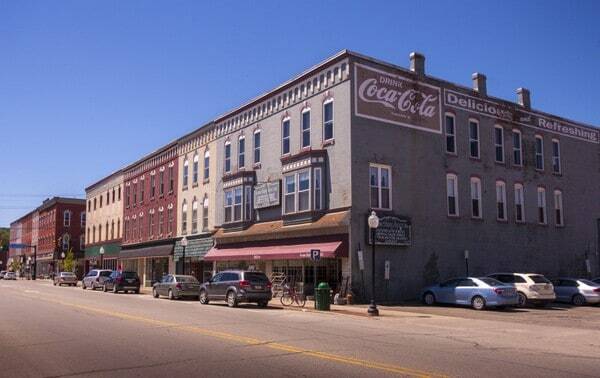 While in Corry, you’ll walk through the well-maintained downtown area. Make sure to stop into The Painted Finch, a local art gallery that exhibits works from mostly regional artists. I was very impressed at the quality of the work exhibited, which was, quite honestly, much higher than I would have expected from a small town art gallery. 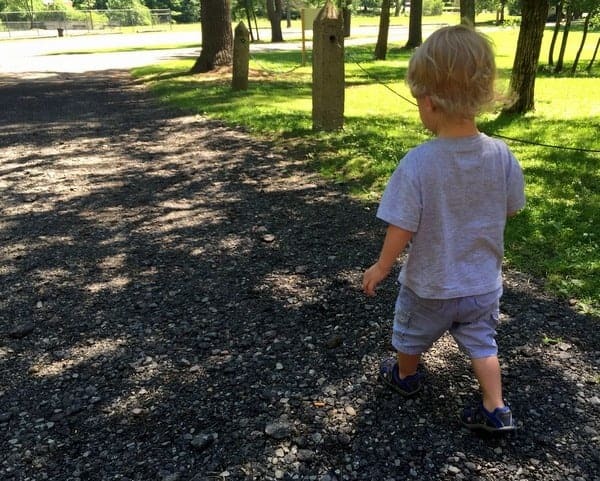 A walk through downtown Corry is fun for all ages. Corry also makes a great place to stop for lunch, and Gigi’s Route 6 Diner, which is directly on Route 6, is a great place to stop. This diner has a great nostalgic feel and some very delicious food, especially the desserts. There is even a small area in the corner that features a few pieces of Route 6 memorabilia. 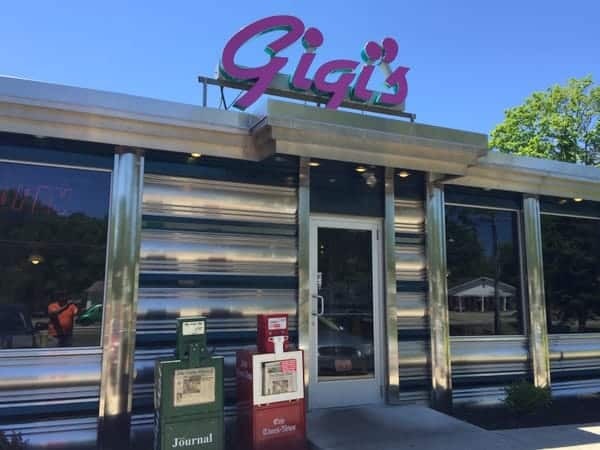 Gigi’s Route 6 Diner in Corry offers great food in a fun setting. A bit west of Corry, Route 6 splits, with Route 6N continuing due west, while Route 6 heads in a southwestern direction running with Route 19. While I’d recommend continuing the journey along Route 6, there is one stop on Route 6N that’s worth making: Goodell Gardens and Homestead in Edinboro. Goodell Gardens and Homestead is aa small, but well-maintained and ever-expanding botanical garden and arboretum. It is located on a 78-acre farm that was donated by the Goodell sisters. The gardens offer pleasant strolling and features many plants that are very unique for the area. The old homestead features a small museum about the life of the sisters. 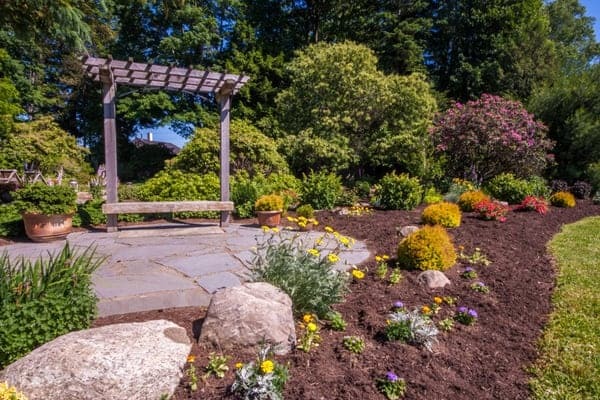 The Goodell Gardens and Homestead is home to some of Pennsylvania’s most unique gardens. Make your way back to Route 6 and head to your next stop, Erie National Wildlife Refuge. 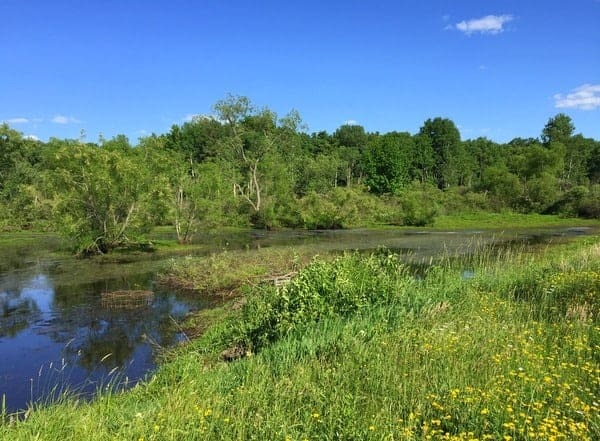 Designated an Important Bird Area by the National Audubon Society, the Erie National Wildlife Refuge is a nearly 9,000 acre protected area in Crawford County. Over half of the site is in Guys Mills, eight miles west of Route 6 and Meadville. 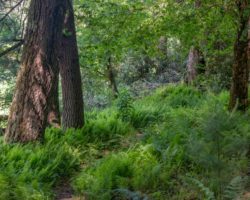 The Tsuga Trail is a short trail that winds its way through a variety of habitats in the refuge. Along this 1.2-1.6 mile trail, hikers pass through beautiful woodlands, marshes, and even open fields. It’s rare to find such a diversity of habitats on such a short trail. The Tsuga Trail in the Erie National Wildlife Refuge offers a variety of habitats for visitors to see. After hiking in Erie National Wildlife Refuge, find your way back to Meadville. 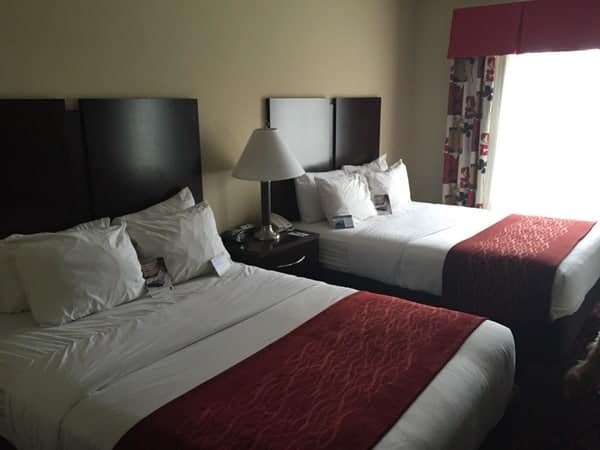 The Quality Inn on the outskirts of town offers a nice, pet-friendly place to stay that is directly on Route 6. 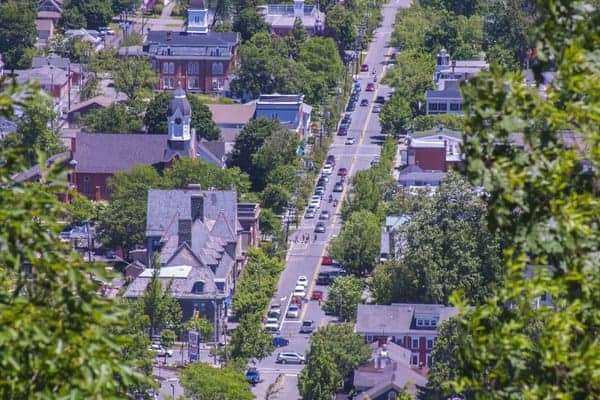 It’s located close enough to downtown Meadville to provide access to the city’s amenities, but it’s also in a great location for finishing your Route 6 trip the following day. You can read reviews of this hotel and others in Meadville on TripAdvisor. Make sure to save some time, either before or after spending the night, to check out downtown Meadville. The Baldwin-Reynolds House Museum is the home of the Crawford County Historical Society. The Baldwin-Reynold’s House Museum is the home of the Crawford County Historical Society and is a fascinating place to visit for those interested in history. 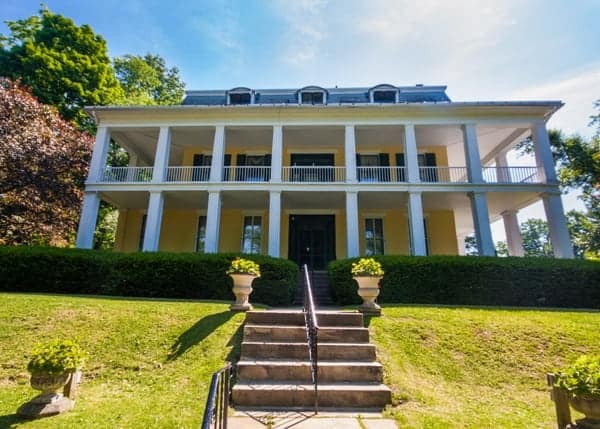 The home was built for Supreme Court Justice Henry Baldwin, but while he had moved in, the home wasn’t even completed when he died in 1844. Later, it became the home of local industrialist William Reynolds. Today, the museum tells the story of both men. It also features items of importance to the local community and has an extensive art collection. Another interesting stop in Meadville is the Meadville Market House. 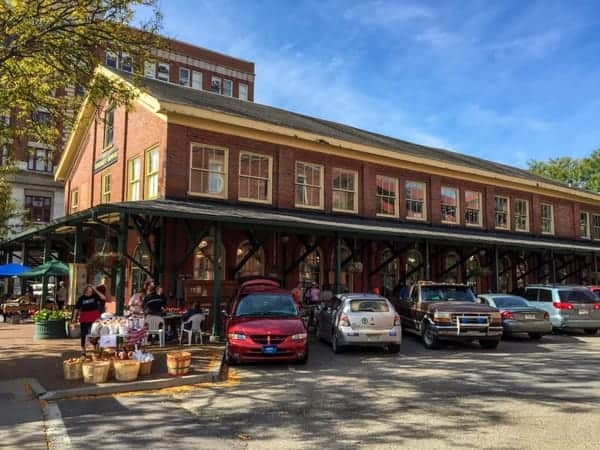 The market house is a great shopping destination and is one of several markets in the state that claim to be the oldest. You can browse the many items on the shelves and even get a meal onsite. The Meadville Market House is a highlight of downtown Meadville. For beer lovers, Voodoo Brewing Company is also located in downtown Meadville. Their tasting room provides a laid-back atmosphere and their beer is some of the best I’ve had in Pennsylvania. Even as I write this, I’m getting a bit sad thinking of how far from home this brewery is. If you visit on a Thursday through Sunday, their kitchen offers great-tasting food as well. On the outskirts of Meadville is the PennDOT Road Sign Sculpture Garden. 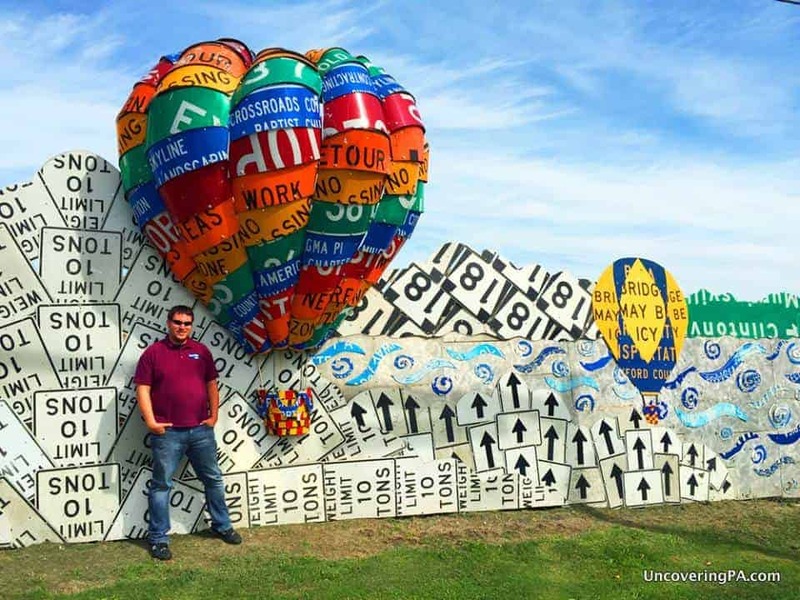 Located on your right as you head along Route 6 from downtown Meadville to the Quality Inn, this 1,200-foot-long mural is made entirely out of used road signs. The mural was designed by a local artist and features a variety of scenes related to Meadville’s history. A small portion of the PennDOT Road Sign Sculpture Garden in Meadville. Almost directly across the street from the PennDOT Road Sign Sculpture Garden is the Ernst Trail. This five-mile rail trail offers a chance for walking and biking through the woods south of downtown Meadville. Roughly a quarter mile from the Beans Trailhead is a modern covered bridge that’s built over a small creek. This bridge adds a unique feature to this beautiful trail. 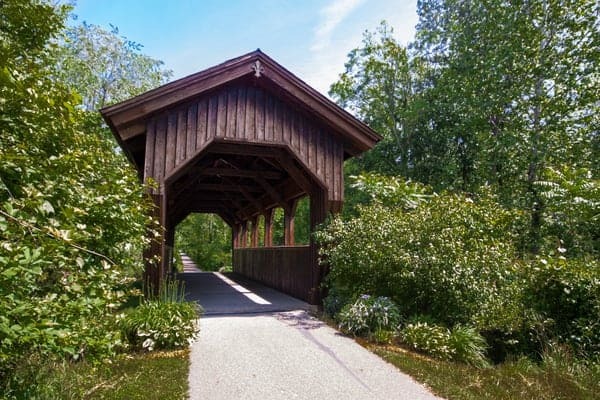 The Ernst Trail in Meadville features a beautiful covered bridge. A good lunch or dinner stop in the Meadville area is Eddie’s Footlong Hot Dogs. This local restaurant has been family owned since 1947 and serves local favorite Smith’s Hot Dogs. I’m not personally a huge fan of most hot dogs, but I very much enjoyed my meal at the restaurant directly along Route 6. A few miles west of Meadville is Conneaut Lake, the largest natural lake in Pennsylvania. Along the lake’s western shores is Conneaut Lake Park. This park was opened in 1892 and features many historic rides. Many of the rides in this free-admission park date back more than five decades. The most well-known ride at Conneaut Lake Park is the Blue Streak. 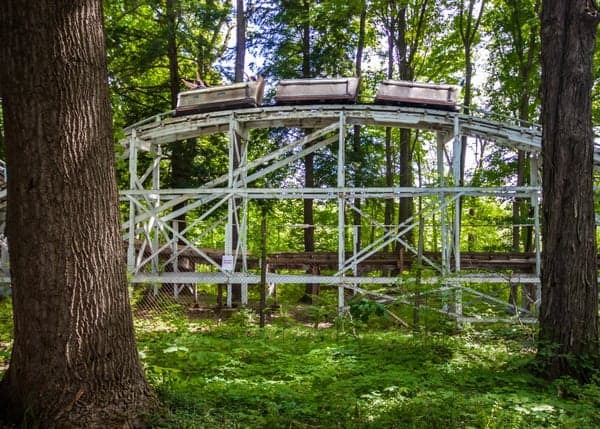 Built in 1937, this roller coaster is the 17th oldest, wooden roller coaster in the country. Be prepared, as this roller coaster takes passengers on quite a ride and tosses you around much more so than many modern coasters. The Blue Streak at Conneaut Lake Park is one of the most historic roller coasters in Pennsylvania. The park is also home to a free beach on the lake. While it has a bit of a party vibe, there were still plenty of children and families enjoying the lake’s waters. From Conneaut Lake Park, it’s only 15 miles to the end of Pennsylvania Route 6 and the Ohio border. Before getting there, however, make a brief detour to Where the Ducks Walk on the Fish in Pymatuning State Park. Located along the Linesville Spillway in Pymatuning Lake, this very literally named spot is a popular place to feed fish and ducks. Here, hundreds of large fish and dozens of ducks vie for bread thrown down to them from visitors. It’s definitely an interesting sight that’s worth seeing. 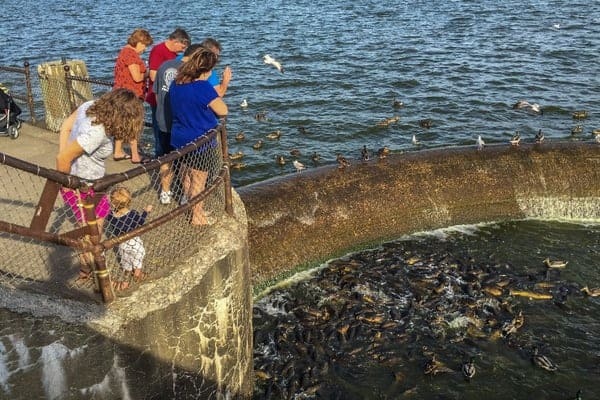 Visitors feed the fish and the ducks at the Linesville Spillway on Pymatuning Lake. Finally, it’s time to cross into Ohio and end your journey along Pennsylvania Route 6. Unlike the New York/Pennsylvania border, there are both state line markers and a milepost directly on the state line. Quite conveniently, the sign is mile 0, signifying that your family road trip across Route 6 is complete. Mile 0 on Pennsylvania Route 6 on the PA/Ohio border. 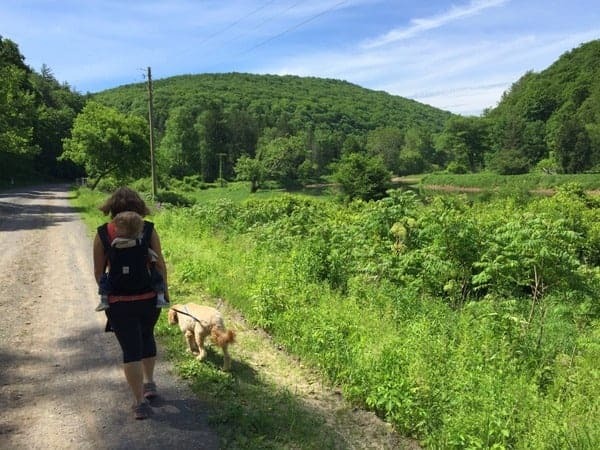 If you skipped down to the bottom of the article, but want to eplore more of PA Route 6, check out Part 1: Matamoras to Tunkhannock and Park 2: Tunkhannock to Kane. Looking for more? 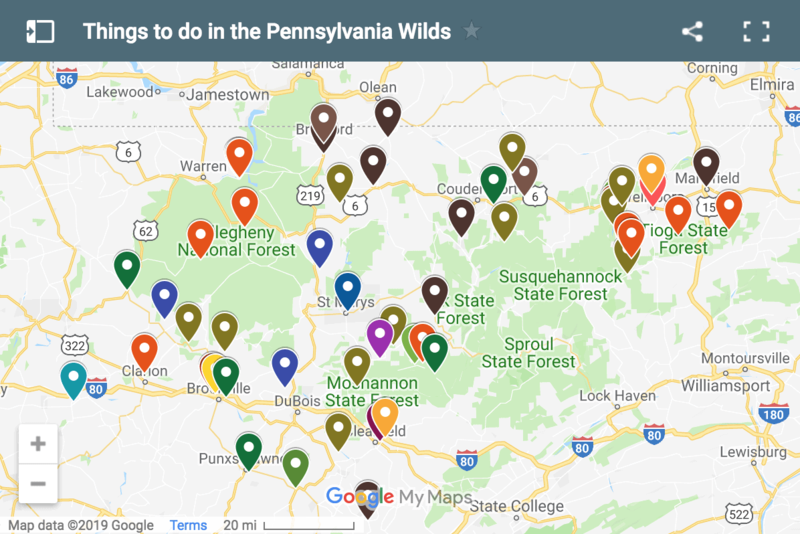 Check out our top road trips in Pennsylvania. I think I would enjoy following your Pennsylvania. Do you have a PDF of all 3 articles ? I don’t have PDFs of my articles. Sorry. Kinda of skipped over White Mills with two fabulous glass museums and Honesdale with barely a mention. Disappointing especially since it is the Birthplace of the American Railroad. We also have a QR code tour with over 20 local historic sites. Great museum and one of the most scenic train excursions that I have ever been on. I do want to get up to Wayne County and explore more of the area. Unfortunately, on the particular trip included in this article, there were too many places to mention everywhere. How did you miss Honesdale! So many fabulous thrift stores, historical sites, brewerys, coffee and so much more. You did not mention the Wellsboro Diner. Well the Red Rose Diner in Towanda is closed. You skipped right over Troy. There is a pretty nice farm museum located in Troy with a lot of historical items. Sad to hear that, but thanks for the update. I’ll make sure to fix that. Unfortunately, even with a week and 7,000 words, I wasn’t able to cover every single spot worth visiting on Route 6.